Best of luck, Mike Strahan. And good choice going out after the most amazing Super Bowl I've ever seen. How could you possibly top that? And why would you want to spend time in the same locker room as that dillweed, Shockey? Like seemingly every other athlete upset about his "treatment," Shockey first claims how, unlike his team, he's not going to air his grievances in public. He then, of course goes on to air his grievances in public. "The Giants said untrue things about him." "They use me wrong." "Not fair. "Blah, blah blah. God, I wish this guy would get traded to the Saskatchawan Rough Riders. But if I were the Yanks, I would hone in on Garrett Atkins as long as the belief was that he could play first. He is about to get very expensive and, in Ian Stewart, Colorado has a high-end prospect ready to replace Atkins at third now. Atkins destroys lefty pitching and is not a free agent until after 2010. Colorado needs a longterm answer in center, and the Yanks should not be afraid to deal Melky Cabrera as a key element to a major deal (does Cabrera, Kennedy and Melancon get this done?). Hmmm, so you have a team that is creaky-old and well out of the race for the playoffs. So by all means,, trade your youngest player and the farm system you have been building for years. Yeah, because that worked so well in the 80s. 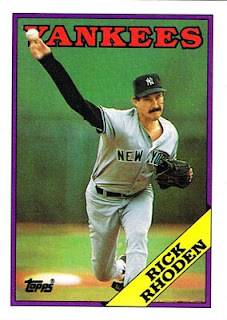 (Would you still make the Doug Drabek for Rick Rhoden trade, Sherman?) Seriously, Cabrera, Kennedy AND Melancon? Why not throw in the new Yankee Stadium? Sure, Atkins is a nice player, but what do we do with Giambi, Matsui and Damon in the 1B/LF/DH mix? And yes, Shelley hasn't hit much, but that's partially because he plays once every six days because he's buried behind aging vets with fat contracts. So you propose the Yanks give up a young talented, pitcher, another young pitcher who's tabbed to be the 8th inning guy possibly as soon as August. And we give up Melky and do what? Play chicken-arm Damon back in center, Matsui back in left, every day (even though his knees still hurt?) And this is the trade that would get us back to the playoffs. No. You know, no matter how many times they throw up pictures of Bird and Magic, Russell and Chamberlain, this NBA Finals series still doesn't make my blood rise. Just can't seem to care. How long until the "Barry Bonds to...." rumors to EVERY TEAM team go away? Bary going to Boston, to Milwaukee, to Texas. Enough. Let him just crawl away please. 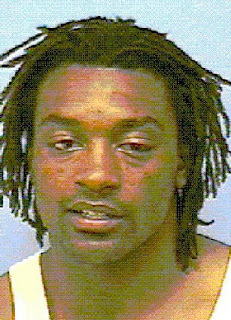 And lastly, just a big league move by Cedric Benson this weekend. You've been a professional disappointment. And you have one case pending of DUI, (in this case, a boat) so what do you do? Do you lay low and show up to camp in good shape, ready to prove something. Or do you go out, break curfew, got drunk with dinner and then go drive a car. Hmmm, tough choice. But I guess not if you're Cedric. Just a class move by the now-surefire Grand Poobah Winner of Supreme El Busto of the 2005 draft. Just a dunce move, Cedric. Strahan made a great move. He could have played one or two more seasons, but I'm sure they wouldn't have been very productive. I thought Bruce Smith played a little too long, and he looked awful those last couple of years. Out on top is a good thing. Shockey really is annoying, isn't he? They need to call Al Davis repeatedly until he takes Shockey off their hands. Nobody else in the league would touch him except the Eagles. Joel Sherman is talking out his rear end. I think we should just ignore him. The Yankees have made their bed this year. Let's just play it out and see if they can get back into the race. Then we can jettison the dead weight at the end of the year. You're right, Paul - the NBA Finals are weak. Perhaps Benson missed his calling, I think he has a bright future as a skipper for an Exxon tanker with an Alaskan route.